Our upscale Villas with Sofa bed, Sleep 8 have beautiful lagoon/golf views. Our 4 ocean-oriented villas are conveniently located in Palmetto Dunes, a lovely plantation and are near the Fazio clubhouse on Carnoustie Road. FREE tennis court time is offered in the Centrecourt villas and high speed internet access is available in all villas. Only a short walk to all your favorite activities. Choose from swimming, tennis, pickleball, golf, biking, hiking, fishing, and canoeing, kayaking. All of your favorite activities are just a short walk from the villa. Travel + Leisure Family magazine named this 2,000-acre paradise the #1 family resort in the United States. Each villa offers the conveniences of a home with the amenities of a resort villa. The beautiful interiors of 7806,7807, & 7808 Centrecourt feature an open floor plan with a balconies overlooking a quiet lagoon which abounds with wildlife. The Centrecourt villas have two master bedroom suites, each with two queen beds, a make-up/dressing area, full mirror over the vanity, and separate bath. These decorator-furnished villas are spacious, fully-equipped, and are kept in excellent condition. The 294 Turnberry villa has a king bed in one bedroom and 2 queens in the other plus a designer kitchen with granite counters. The kitchens are fully equipped with all that is needed - cookware, dishes, glassware, coffee pot, blender, toaster, and of course an oven, refrigerator, microwave, dishwasher, and garbage disposal. The washer and dryer are conveniently located in the Centrecourt kitchen closet and in the Turnberry hall next to the kitchen. The Centrecourt villas all also offer large living and dining areas with lagoon views. The Turnberry villa overlooks the Fazio Golf course. You'll have all the comforts of a well-appointed yet surprisingly affordable home. Our 3 Centrecourt villas have a Centrecourt pool only 50 yards from our villas and have onsite tennis maintained by the Palmetto Dunes Tennis Center. Our Turnberry villa also has its own pool and playground in the circle area in front of the villas. Palmetto Dunes is a semitropical oceanfront vacation resort, ideal for total relaxation and an infinite variety of year-round activities. Come and enjoy the natural charm and beauty of Hilton Head Island, known for its world class beaches, recreation, and Low Country heritage. The island offers an unhurried pace all its own. Come to our villas to enjoy luxurious island living. Explore the beach, play golf or tennis, shop, see the sights - the choice is yours. Watch an egret wade in the water or a heron swoop down. Many surprises await your discovery. Hilton Head is rated #10 in the world by Golf Digest Magazine and is rated #2 in the world for tennis instruction and events by Tennis Magazine. Visit the Museum of Hilton Head, entertainment at the Shelter Cove gazebo or in local restaurants, stop at the general store or Shelter Cove Harbour Marina & shop, enjoy fine dining or casual bites. NOTE: Pets are considered but not automatically allowed due to our concern that future guests will not be affected by the prior one's pets. Check out what is happening in our Hilton Head Island calendar of events. The calendar includes local arts, nightlife, family activities, festivals and much more. This year's 2019 spring band line up in Shelter Cove is as follows. All shows are weather dependent. Our family was on the way home from a Disney World vacation when we stopped to visit Hilton Head Island on the recommendation of a friend. After spending several days on the island we knew that this was the place that we would want to come year after year as long as we could share the costs of ownership with others who would like to rent from us. We now are coming down not only with our children but with our grandchildren who love vacationing there as much as we do. Last summer Ava, then 6 and Nile, then 8, turned into real swimmers and would spend hours doing either frog and dolphin-like strokes and searching the ocean floor for sand dollars which they kept under water so as not to hurt them. This was truly a life-changing summer vacation. The girls went home to sign up for swim team and soon after were telling me about their flip turns and swim events. We hope that you will read the comments many of our guests have made to see how many special vacation opportunities abound and will find the magic of the island for yourselves. 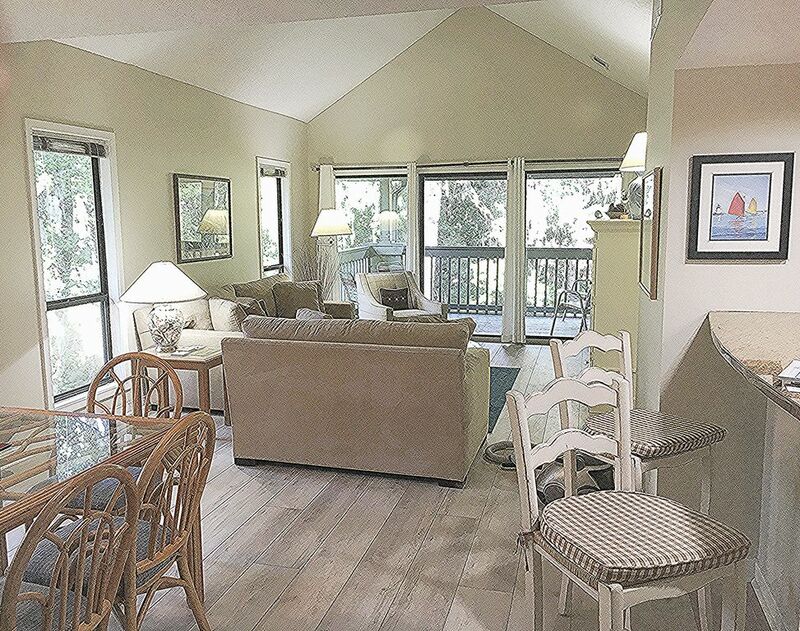 We chose our sunny 7806 Centrecourt villa because of the beautiful view of the lagoon which sparkles in the sun and attracts egrets, herons, and other wildlife. The villa offers excellent views of the lagoon since all major living areas in it do overlook this lovely lagoon. The villa also has a light airy feel since it faces the south and also has a vaulted ceiling and bay window. We love the layout which is spacious and well planned. Centrecourt is both a short walk to the beach and centrally located on the island so essentially everything that we could want to do or see is close by. Each visit brings new discoveries and new adventures. Come and see for yourselves. You too will be won over by this wonderful vacation villa, the beauty of the surroundings, and the wealth of ways to explore and enjoy the island! And, now we have added 4 villas nearby to our group so that groups can easily rent 2 or 3 villas if those villas are still available to book. We find that folks return year after year to the beauty and comfort they seek and know they can count on! There are so many unique benefits to staying at our 7806 Centrecourt villa or one of the other Centrecourt or Turnberry villa in our group. You will vacation in a villa that is well-appointed yet surprisingly affordable and kept in immaculate condition. When renting a Centrecourt villa you will have free tennis court times at the adjacent courts plus weekly tennis exhibitions to view, free Palmetto Dunes Buggy service to take you anywhere you wish to go in Palmetto Dunes or Shelter Cove, weekly fireworks during the high seasons, dining opportunities at both casual and elegant restaurants, and many exciting night spots for dancing and fun. You can explore the pristine marshes of Broad Creek, paddle our 11 mile lagoon system, golf at championship golf courses nearby, soak up the sun and enjoy the warm waters of the ocean and find the kind of relaxation that only comes from listening to the surf and sound of the seagulls. Music & Taste on the Harbour is back on Thursday nights at Shelter Cove Harbour starting March 30 (weather permitting). Enjoy live music, great food, casual waterfront dining, unique shopping and beautiful sunsets. April 6 – Deas Guyz April 13 – The Headliners April 20 – Target April 27 – The Headliners May 4 – Deas Guyz May 11 – Target May 18 – The Headliners HarbourFest at Shelter Cove Harbour & Marina on Hilton Head Island, SC is a weekly celebration during the summer (every Monday - Friday) with live music featuring Shannon Tanner, entertainment from Cappy the Clown, art & crafts and activities for kids. Tuesday nights during HarbourFest are the traditional fireworks nights featuring a spectacular show that lights up the summer nighttime sky. This family-friendly event has been enjoyed by thousands of visitors for the last twenty-seven years! This year, Firework shows will be held on the following Tues. Jun. 13, 20 & 27 July 4, 11, 18 & 25 Aug. 1, 8 & 15 Wed. if rain Check http://www.hiltonheadisland.com/events/ for more events in our area. All 4 villas have 2 full baths. The Palmetto Dunes Resort offers 3 miles of beach, 3 golf courses, 25 tennis courts & the best programming to improve your game, dining at casual to elegant restaurants & an exciting harbor-fun 4 all! The Turnberry villa has a view of the 10th and 18th holes of the Fazio Golf Course. The Centrecourt villas are across the street from the Fazio Golf Course. Our 3 charming Centrecourt villas have lovely lagoon views from living and dining rooms, both bedrooms and large, wood-decked balcony. Our 294 Turnberry villa sees the end of the lagoon. Efficient air conditioning and heating keep guests comfortable year-round. Located in the Centrecourt kitchen laundry closet and in the Turnberry hall closet. Ample parking is always available in front of our villas. All villas have free high speed WiFi internet access for guests. Spacious living rooms with large flat screen TV's allow for relaxation, reading, game playing, or catching up on the best of TV entertainment. Extra chairs may be used to include 8 in villas allowing 8 guests. Each villa has 3 TV's so that you may choose to watch TV in the living room or in one of the bedrooms. There is lawn area by each of the villas for children to play. 12 .5' X 8.5' Centrecourt balconies have wood decks & overlook a sparkling lagoon where birds swoop in. The Turnberry deck overlooks the Fazio Golf Course's 10th & 18th holes & the end of the lagoon. Bring you kayak or rent one from Hilton Head Outfitters. Traverse our 11 mile calm and scenic lagoons. All Centrecourt villas have large decks that overlook the lagoon. One 2017 guest saw a little, lazy alligator. The Turnberry villa views the golf course and the end of the lagoon. 2 hours of free tennis & pickleball court time at the Palmetto Dunes Tennis Center is provided for 7806, 7807, and 7808 Centrecourt villa renters. The Fazio, Trent Jones, & Arthur Hills Golf Courses are all located in Palmetto Dunes. Play while viewing the ocean or lagoon. Enjoy spectacular views! Check the Gold Key coupon book for discounts. Centrecourt and Turnberry villas each have their own private pools. Decorator Furnished & In Excellent Condition, Fully-equipped Kitchen with Microwave, Laundry Room, Cable, 3 TVs, Stereo System with CD & Tape Deck, Phones, Ceiling Fans(7806 & 7808 CC), Large Bay(7806 & 7808 CC) & Mitered Glass Windows, Vaulted Ceiling(7806 & 7808), Kitchen-to-Dining Pass Through/Breakfast Bar, Granite Countertops (Turnberry & 7806 Centrecourt), 4 Queen Beds/ 1 king and 2 queens plus Living Room Queen Sleeper-Sofa, Pool & Adjacent Centrecourt Barbecue, Luxury Linens & Thick Towels provided, Ask about our Pet Policy and for suggestions to personalizing your vacation plans. Choose from a variety of sports, activities and relaxation opportunities or travel to historic Savannah, Charleston, or Beaufort for outings. Shelter Cove provides many restaurants from casual to fine dining as well as stores of every kind and the warm, hilarious Shannon Tanner who entertains children & adults alike May 26-Aug. 29 at Shelter Cove Harbour, 1 Harbourside Lane. Mon.-Fri. at 6:30 & 8 pm. The Centrecourt Villas pool is open Apr. 1st to Oct. 31st. Come for a dip, to swim, to watch the children play, or to lounge along side it on our new chairs. We offer guests 2 hours of FREE Tennis per day at the Palmetto Dunes Tennis Center in 7806, 7807 and 7808 Centrecourt villas. We have availavble Golf at Championship Golf Courses, Nature Preserves, Fine Dining, Strolling on 3 miles of Uncrowded Beautiful Beach, Summer fireworks and family entertainment in Shelter Cove with Shannon Tanner. Palmetto Dunes Resort is perfect for experiencing a unique blend of undisturbed nature, world-class beaches and outstanding amenities, a place where you can find a wonderful mix of luxury, romance, excitement or relaxation, history and charm, A place for the whole family! Explore Daufuskie Island, Savannah and Charleston on your day trips from the island. NEW - Music and Taste on the Harbour through May 18th from 6 to 9 P.M. Dance the night away on Thursday nights at Shelter Cove Harbour's Neptune Statue. Live music, great food, casual waterfront dining, unique shopping and beautiful sunsets. DUNES BUGGY: The Palmetto Dunes Buggy provides courtesy transportation within Palmetto Dunes, Leamington, and Shelter Cove. Visit the beach, golf courses, restaurants, shops and tennis courts, as well as Shelter Cove Harbour, Shelter Cove Towne Centre, and the Plaza at Shelter Cove. This is a free on-demand service and vehicles will be dispatched on a first-come, first-served, basis as requests are received. For a pickup, call (843) 689-4222.